Dr M is researching for an article about communicating the importance and excitement of plants to young people and he came across a series of open-access lectures on the Gatsby Plant Sciences Summer School website. There is interesting stuff here but one lecture which particularly caught Dr M’s imagination was by Dr Sandra Knapp, of the Natural History Museum, discussing the mysteries of plant diversity and how understanding plant diversity is a bit like a mission to an almost unknown planet. The typically perceptive quote from Carl Linnaeus (Philosophica Botanica 1751): “If you do not know the names of things, the knowledge of them is lost too”. Her own quote that: “a species is a hypothesis about the distribution of variation in nature”. A fascinating description of botanical fieldwork and collecting plant specimens, and how pressing them for the herbarium requires the conversion of a very 3-dimensional object, the plant, into a very 2-dimensional, flat one, and how this is rather like origami, but in reverse! And there is even an example of how Donald Rumsfeld’s infamous “unknown unknowns” concept is really quite pertinent to thinking about what we do – and especially what we do not – know about the number of species on earth (a big unknown unknown!). Spell-binding lectures like this are one of the key drivers which with encourage students into the study and the wonder of plants! Check out the full lecture here. 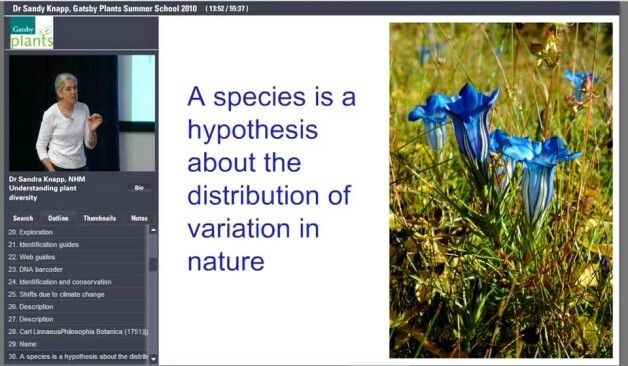 Great post – I have very fond memories of attending that summer school in 2011; among many other factors, it was one of the most influential in making me realise my heart lay in botany… The summer school attracts the most prominent of speakers and, combined with discussions and practical activities, well and truly inspires undergraduate biologists! “My heart belongs to botany” there’s a song in there somewhere…? !